In the first season of Luke Cage, the nigh-indestructible man was, essentially, an island. He was a stranger living on Harlem’s fringes, butting up against enemies with strong ties to the historic neighbourhood. Season two tells us more about the families that spawned Luke, Mariah, and new villain Bushmaster, and does so in ways that make the series much stronger. In its second season, Luke Cage seems far less concerned with the conventional trappings of the superhero genre and prioritises creating a sense of community. Family sits at the core of both community and legacy, and this season looks extensively at the large and small ways people are remembered by those they raise and leave behind. 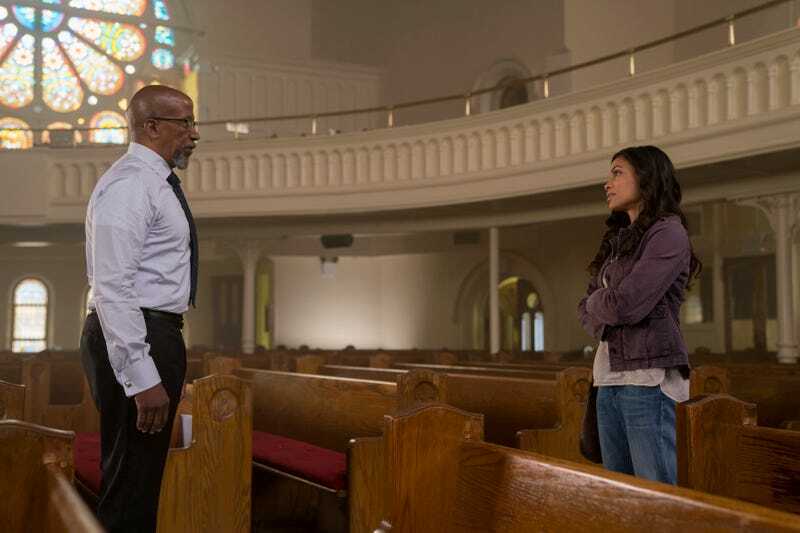 The shift in focus starts almost immediately, with the scenes that introduce James Lucas (Reg E. Cathey), the preacher who’s moved to Harlem to try and reconnect with his superhero son. Soon, criminally connected politician Mariah Dillard tries to mend fences with her estranged daughter Tilda as a way to rehabilitate her image. Jamaican gangster Bushmaster runs into his own tensions with an older relative, too, as his uncle Anansi tries to warn him off the dangerous botanical enhancements he uses to increase his strength and healing. These generational conflicts all heighten the the tensions and themes threaded throughout season two. Every worry Luke has about the propriety and consequences of his vigilante crime-fighting gets exacerbated by his father’s fiery sermons and the arguments they have. James Lucas was present in body but not in mind while Luke was growing up, and lied to the future hero about having another son. When Luke loses his temper or struggles to best chart a way forward, other characters tell him that the baggage from his dysfunctional parental relationship is part of what’s holding him back. The first half of the season sees Mariah desperate to go fully legitimate and sell off her criminal enterprise to clean up her family name and cement a philanthropic legacy. She enlists Tilda as a symbol of her maternal instinct while showing off a free clinic that’s supposed to be a positive lasting influence in Harlem. But as episodes roll on, it seems like she can’t help but be exactly like the people who made her who she is. At one crucial plot turn after her world has burnt down to ashes, Mariah says she’s sick of hiding who she is. The actions that follow horrify Tilda and push her further away from the family that Mariah was trying to valorise and pull her back into. As all of these family-centric threads spool out, they give Luke Cage the chance to do what the show does best: invoke the rhythms of black speech, culture, and spiritual practice in warm dramatic ways and bind them to simmering genre-inflected drama. Though season two still feels like it could’ve been tighter in terms of runtime, I’m glad so much attention was given to the themes of family and legacy. The Luke Cage TV show has always been more about the community than the hero who lives in it, and this season highlights the fact that it’s families who build community. It’s also families who get broken when chaos erupts, and season two shows how that latter truth pushes Luke to be better as a hero.